According to a report released by the Tax Foundation, an effective federal tax rate of 14.0% is higher than what 97 percent of Americans pay. And according to The Tax Policy Center, the average effective federal tax rate for all Americans, as a percentage of cash income, was only 9.3% in 2011. Those in the Top 20 Percent (with incomes over $103,465) paid an average of 14.9%, while those in the Bottom 20 Percent (with incomes below $16,812) received back refundable tax credits averaging 5.8% of their incomes. Within the Top Quintile, the Top 1 Percent paid an average rate of 20.3%, while the Top 0.1 Percent paid an average of 19.8%. It’s important to note that these are averages, which means that within each quintile some pay more than the average and others less. But overall, since the average effective federal tax rate for all of America is 9.3%, this represents a kind of minimum benchmark. What’s your effective federal tax rate? Under the traditional model, in 2011, Mitt and Ann Romney paid an effective federal tax rate of around 14.0% (see definitions at the end), while Barack and Michelle Obama paid 17.8% (see table below). So does that mean the Obamas are more patriotic? Before you answer that, consider that the Romneys paid a total of $1,912,529 in federal income taxes, versus the Obamas $150,253. So does this give the Romneys the upper hand? Digging a little deeper, it turns out that the Romneys paid an effective state and local tax rate of 11.3%, compared to the Obamas 7.0%. The Romneys also paid $1,541,905 in state and local taxes, compared to the Obamas $59,804. Shouldn’t state and local taxes be counted as well, since they are, after all, taxes? Yes, of course. 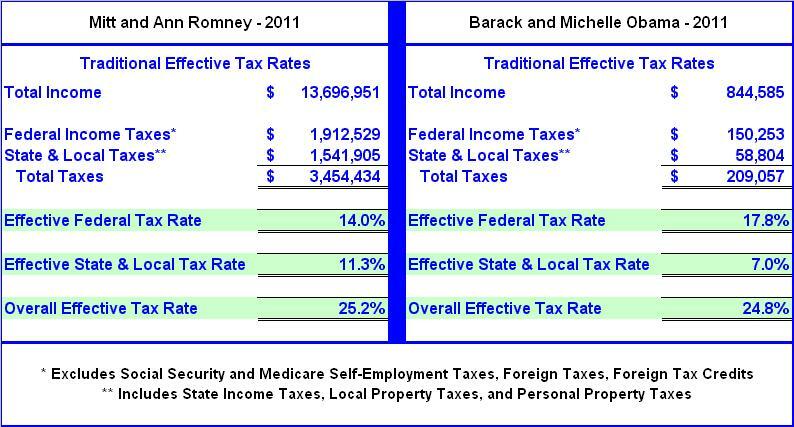 So when all taxes are on the table, the Romneys overall effective tax rate was 25.2%, compared to the Obamas 24.8%. And, the Romneys paid a total of $3,454,434 in federal, state and local taxes, versus the Obamas $209,057. So in light of these facts, is one of the two presidential candidates better suited for the Oval Office than the other? Is one a tax deadbeat and the other a saint? If a presidential candidate’s effective tax rate matters, then this election should be a toss up. But if it doesn’t, then Barack Obama’s entire – fair share monologue – is nothing but rubbish. The question is – what really matters? Perhaps a more suitable measure of patriotism may be found in one’s real effective tax rate. One way of lowering U.S. tax liabilities is through charitable giving. When gifts are given to charity, the taxpayer no longer controls the assets, and so is granted a deduction against his (or her) taxable income of as much as 50% of adjusted gross income. Depending upon one’s marginal tax bracket, the tax savings may be as high as 35% of the amount given. What happens to the money once it has been gifted? It gets spent by recipient organizations on salaries and wages, goods and services, real property, or is otherwise invested toward its charitable endeavors. Thus, charity is wealth redistribution, or if you will, a type of voluntary taxation. I would add that charitable giving is a much more efficient means of spreading the wealth than the U.S. government’s wasteful method, which after a certain limit may be summed up as little more than legalized robbery. In 2011, the Romneys gave away $4,000,000, or about 29.0% of their income, although they only chose to claim a tax deduction of $2,250,772. The Obamas donated $172,130 or about 20.0% of their income. 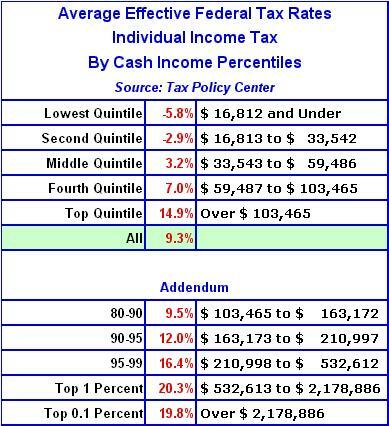 When we add this voluntary taxation to the total amount of taxes paid, we find that the Romneys paid a real effective tax rate of 54.4%, compared to the Obamas 45.1% (see table below). 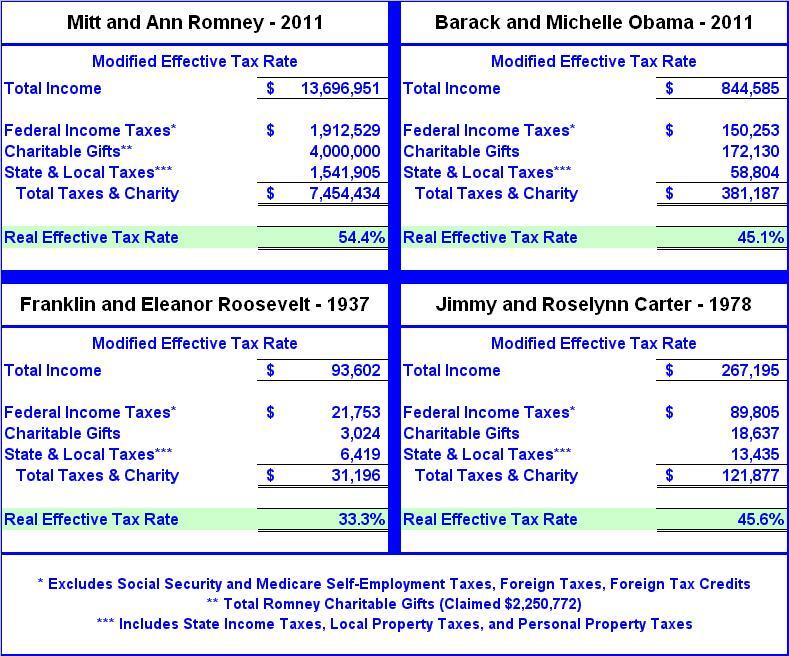 Just to add some perspective I included data from the Roosevelts and the Carters tax returns (above). It’s interesting to note that in 1937, Franklin and Eleanor Roosevelt donated $3,024, or only about 3.2% of their income, while in 1978, Jimmy and Roselynn Carter gave away $18,637, or about 7.0%. When we add the amount of the couples voluntary taxation through charitable gifts, to the total amount of taxes paid, we find that the Roosevelts paid a real effective tax rate of 33.3%, compared to the Carters 45.6%. So was FDR a slacker? Was Jimmy Carter slightly more patriotic than Obama? And isn’t Mitt Romney a better man than them all? Note: The Roosevelts income of $93,602 in 1937 is equivalent to $1,504,178 today, while the Carters income of $267,195 in 1978 is equivalent to $948,325. A study of historical Presidential tax returns is interesting, informative, and highly recommended for anyone serious about tax reform, as is a study of historical income tax rates. It’s notable that 94.8% of the Romneys income came from investments – interest, dividends and capital gains, versus -12.8% for the Obamas. The Obamas tax return includes a capital loss carryover of $116,151, a consequence of failed investments from the past. That’s interesting, since Barack Obama is the one always harping on the idea of government investment, yet all the while it turns out that successful investing is a trait beyond the scope of his expertise. Small wonder his taxpayer-funded green energy investments have turned out to be dismal failures. What’s even more notable is the fact that roughly 62.4% of the Romneys income came from capital gains and qualified dividends which, based on current law, are taxed at a maximum rate of 15.0%. In contrast, around 99.0% of the Obamas income came from wages and net book sales which are taxed at ordinary rates of as high as 35.0%. Thus the Romneys effective tax rate should be considerably lower than the Obamas; but it turns out that both couples effectively paid about the same overall effective tax rate, 25.2% versus 24.8%, as explained earlier. So in spite of favorable capital gains rates, overall effective tax rates tend to balance out. One reason for this phenomenon is that most of the States don’t reciprocate (i.e. there is no favorable capital gains rate at the state level). Next, we find that the Romneys paid $102,790, or 0.8% of their income, in foreign taxes, while the Obamas paid $5,841, or 0.7%. Thus, on a percentage basis, both families earned about an equal amount of their income from foreign sources. So is either candidate more likely to outsource American jobs than the other? I guess Obama could limit sales of his books to the USA, and cut-off the rest of the world, as if that would make any sense. I’ll let you figure that one out. Next, we discover that the Obamas claimed a retirement contribution deduction of $49,000, or 5.8% of their income, while the Romneys claimed none. Foul! The question is that since Barack Obama now qualifies for a $191,000 a year presidential pension, why is he continuing to maximize the simplified employee pension account (SEP) deduction? In the private sector, the most anyone can exclude from income for retirement purposes, including employer matching contributions, is $49,000 per year. Yet Barack Obama gets to claim this maximum deduction, while at the same time deferring taxes on the annual contributions the U.S. Treasury makes to his pension account. Does that sound fair to you? Is Obama paying his fair share? Is a guaranteed $191,000 a year for life, on top of a virtually unlimited presidential expense account, insufficient for Mr. Obama? In stark contrast, Mitt Romney refused to take a salary while he served as Governor of Massachusetts. So has anyone bothered to ask if he would waive his presidential salary? Would he also consider waiving the presidential pension and lush lifetime expense account? Somebody needs to ask that question. By the way, Mitt Romney could have claimed exactly the same SEP-IRA deduction that the Obamas did, based on his net business income, which would have further reduced his tax liability, but chose not to. So what does this say about character? Next, the Obamas also claimed a $47,564 home mortgage deduction amounting to 5.6% of their income, while the Romneys claimed none. Wow! So since the Obamas claimed both a $47,564 home mortgage deduction, and the $49,000 maximum retirement contribution exclusion, while the Romneys claimed neither, this gave the Obamas an 11.4% handicap. Note: According to the Internal Revenue Service, in tax year 2010, only 25.8% of tax filers claimed the home mortgage deduction, which kind of makes the case for placing limits on this deduction. Now when it comes to charitable contributions, as stated earlier, the Romneys gave $4,000,000, or around 29.2% of their income, while the Obamas gave $172,130, or 20.4%. 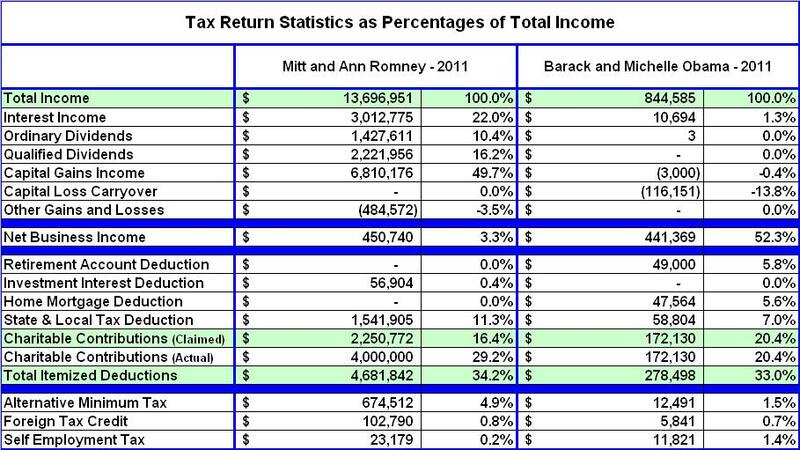 But since the Romneys only chose to write-off $2,250,772, their actual deduction amounted to just 16.4% of their income. So once again the Obamas had a slight advantage, yet when their total itemized deductions are compared, we find that the Romneys amounted to 34.2% of their income, while the Obamas amounted to 33.0%, or about the same. Finally, the Romneys federal taxes included an Alternative Minimum Tax (AMT) of $674,512, representing 4.9% of their income, while the Obamas incurred a liability was $12,491, or 1.5%. The AMT limits certain deductions and tax preferences to ensure that high income earners pay at least a minimum amount of tax. So what will happen when the AMT is eliminated? Will the rich pay less in taxes? Not necessarily, because if the same deductions and tax preferences for high income earners were eliminated from the get go, then the AMT wouldn’t be necessary. Isn’t this the objective of tax reform, to eliminate deductions and preferences, lower tax rates, and thus simplify the tax code? So when tax rates are cut by 20% in the next year or two, and that’s where we’re headed, the first place to look for deductions and preferences to eliminate is within current AMT regulations. So what’s the point? First of all, we learned that in 2011, the Romneys paid a total of $3,454,434 in federal, state and local taxes, while the Obamas paid $209,057. When state and local taxes were added to the mix, we found that the Romneys paid an overall effective tax rate of 25.2%, versus the Obamas 24.8%. But when charitable contributions were figured in, we discovered that the Romneys paid a real effective tax rate of 54.4% compared to the Carters 45.6%, the Obamas 45.1%, and the Roosevelts 33.3%. What should be clear is that measuring a person by the size of their effective tax rate reveals nothing about their character. If those who pay the largest share of taxes are the most patriotic among us, then that all but eliminates everyone except for the Top 1 Percent. If effective tax rates are so important, then why not simply convert to a flat tax (i.e. the FairTax)? That way the concept of effective tax rates becomes meaningless. In a perfect world it seems this would be the goal. Is paying more taxes than absolutely necessary savvy? No, but anyone who voluntarily pays more must really love this country. Mitt and Ann Romney didn’t claim all of the charitable contributions they could have, and thus paid a higher amount in taxes than legally required. When it comes down to it, no one that I know cares anything about increasing their own personal effective tax rate; most are like the Obamas, preoccupied with finding ways to reduce it. The main point of this post has been to prove that measuring any American by the size of their effective tax rate reveals next to nothing about the content of their character. Thus, Barack Obama’s entire fair share mantra turns out to be nothing but rubbish. The rich already pay more than their fair share sir. It’s time to bring on a business guy, someone who really understands what’s going on in this country. It’s time to lower income tax rates, limit deductions and preferences, broaden the tax base, and reduce the size of government. It’s time to lower the federal deficit and move towards a balanced budget. It’s time to purge Barack Obama’s jaded philosophy of – do as I think, not as I do. (a) The Traditional Model – Under the traditional model, the effective tax rate is calculated by dividing total income taxes (before tax credits and other taxes), by total income (before exclusions and deductions). (b) Effective Federal Tax Rate – The effective federal tax rate is determined by dividing total federal income taxes (before tax credits and other taxes), by total income (before exclusions and deductions). (c) Effective State and Local Tax Rate – The effective state and local tax rate is determined by dividing total state income taxes, real estate taxes, and personal property taxes claimed on federal Schedule A, by total income (before exclusions and deductions). (d) Overall Effective Tax Rate – The overall effective tax rate is calculated by dividing total federal income taxes (before tax credits and other taxes), plus total state and local taxes as in (c), by total income (before exclusions and deductions). (e) Real Effective Tax Rate – The real effective tax rate is calculated by dividing total federal income taxes (before tax credits and other taxes), plus state and local taxes as in (c), plus charitable contributions, by total income (before exclusions and deductions).